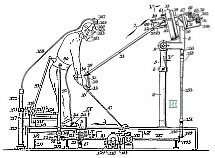 Among the many strange inventions that have been filed by patent attorneys, this golf practice apparatus is one of them. In his patent, George states that an ideal golf swing can only be achieved when multiple parts of the body are coordinated with one another. He points out that various products exist to help golfers with their swing but most of them focus only on one or two parts of the body. He mentions devices for controlling excessive hip motion or restraining shoulder movement as examples. What is unusual about this strange invention is that it attempts to control every part of your body used in a golf swing - from the head, shoulders, arms, hips, wrists, hands, knees, right down to the feet. The gun helmet was a strange invention by Albert Salardi. The patent describes how warfare is physically and mentally demanding on fighting men. It explains that soldiers must carry, assemble and operate devices while fighting. The patent states that soldiers need to use their hands when shooting a gun. If soldiers could "shoot their guns without using their hands, they could do other things - like cut barb wire or carry and assemble equipment while shooting their gun if needed." To solve this hands-free gun shooting problem, Al invented a helmet embedded with a gun that can be triggered by a mechanism in the mouth - while leaving his arms and hands free to do other things. Presumably while shooting other people. Of course, it is duly noted that soldiers are not the only persons that shoot guns and the patent attorney writes the following description, "Police officers and prison guards at present cannot use their hands and arms, while pointing their firearms, to subdue prisoners." 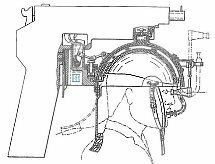 Although this strange invention was never adopted by the arm forces or police, presumably due to the lack of safeguards to prevent accidental shootings caused by sneezing, it was cited as prior art to the invention of "night vision goggle-mounted helmets" used by the military. This strange invention wraps around your head like a "Spiderman" mask. It's purpose is to provide resistance to the muscles in your face when you perform facial exercises. The idea behind the mask is that toning the 43 muscles in your face will reduce wrinkles and sagging skin. The Facial Trainer doesn't exercise your face but wraps tightly around your head so it's harder to move the facial muscles as you go through a series of exercises suggested by the manufacturer. Sort of like fitness equipment, which a lot of people like to collect and keep in their closets, under their beds, or stored in their basements.